When BMW unveiled the original 3 Series more than 30 years ago, model name 2002, there was no way the Bavarian firm could have predicted how integral to its existence it would become. The latest incarnation is being touted as the most refined and desirable variant to date and given the standard of the opposition, it'll need to be. With the exception of the Volkswagen Golfs and Honda Civics of this world, very few models make it to the 30-year mark. However, the BMW 3 Series can now take its place in this distinguished club thanks to the arrival of the latest generation E90 variant. 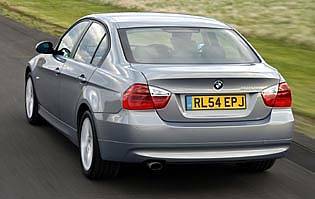 Bigger, more refined and generally better than the model it replaces, the 2005 3 Series is most certainly a quality product worthy of sporting the blue and white propeller badge on its snout. But how will it match up to the opposition? Never has the competition in this market segment been quite so fierce. The Mercedes C-Class, Jaguar X-Type and Audi A4 (to name but three) are all extremely well engineered machines worthy of the adoration of aspiring executive types. In the face of such rivalry BMW couldn't afford to make any oversights that would let those waiting in the wings take advantage. First impressions of the new 3 suggest that there have been no such oversights or omissions. All of the main bases appear to have been covered. Styling, drivability (a BMW's trump card), refinement and safety are all as good if not better than the outgoing model. Although it doesn't come cheap, the 3 Series is still just that little bit better than the opposition. Young upwardly mobile executive types will still be queuing up to get there hands on it. The 3 Series is an expensive car, so those on a tight budget need not apply. Fuel economy leaves much to be desired in most cases making trips to the pumps unhappily frequent – unless you opt for a frugal but lively diesel. Insurance, servicing and repair costs are all also on the high side. Depreciation will be manageable, however, which will help keep down the cost of ownership. Obviously, those looking for a seriously practical BMW should look to the Touring, but that isn't to say the saloon model can't hold its fair share of stuff. The boot is deep rather than tall but can easily swallow two large suitcases or perhaps a bag of golf clubs. The interior also provides several cubbyholes and cup holders to stop things rolling around on the floor. The controls are all well weighted and located in logical positions. The controversial i-Drive system has been made more user-friendly and should now attract fewer criticisms. The main instrument binnacle is a classy affair that is easy to read and in no way confusing. 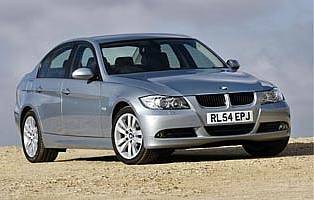 BMW claim that this 3 Series is the most refined model to date. Sustained periods of high-speed motorway cruising suggest that this claim holds water. All forms of wind and road noise are well suppressed, as are vibrations and harshness. 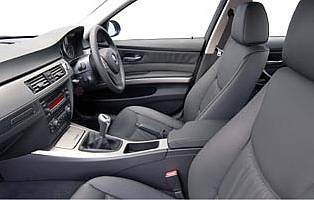 The seats are well supportive and very adjustable meaning that most drivers, regardless of their shape, will be able to find a comfortable position. An electronic vehicle immobiliser, central locking with remote control and a free-wheel lock cylinder should keep the 3 safe from any unwanted attention. Those who purchase the more expensive 330i and 325i models should perhaps consider getting a tracker system fitted. There are more safety acronyms associated with the 3 than is strictly speaking easy to keep up with. Dynamic Stability Control (DSC), Dynamic Traction Control (DTC), Cornering Brake Control (CBC) and Dynamic Brake Control (DBC) are charged with keeping the saloon planted on the road. Dual front, side and head airbags, seat occupant detectors, Isofix child seat anchors and seatbelt force limiters complete the safety compliment. BMW claims that its product is the 'ultimate driving machine' and in executive saloon terms they may well be onto something. A rear-wheel drive configuration affords the 3 a surefooted stance that grips the road really well. The bigger engined variants, such as the 330i and 325i, are also extremely quick in a straight line. BMWs are popular company cars, so there will be a large number of families who enjoy it in that capacity. In many cases the car that the family actually owns will be the second car (a larger vehicle for doing the school run or a smaller car to keep the costs down). The 3 is spacious enough to accommodate up to two little ones and their various bits and pieces, though. Given the costs and insurance groupings involved there won't be too many under 25's queuing up to sign on the dotted line. That's not to say they won't want to, but it simply won't necessarily affordable – unless an employer is footing the bill. 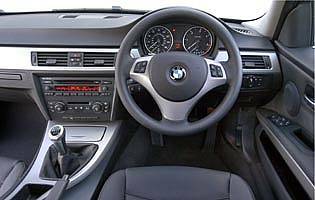 There will always be those who view BMW owners as young, aspiring exec types and will refuse to let them out of side turnings and junctions. However, those who can afford to buy into the BMW brand are likely to be fairly immune to this hostility. In terms of quality, the two big German luxury brands i.e. Mercedes and BMW are still largely ahead of the game. Certainly in the engine department, BMW enjoys an almost untarnished reputation. The 3 does have a rather sporty stance but still doesn't represent too much of a climb down when it comes to getting in. The seat bases are very wide and supportive and easy to get into. Door apertures are large both front and back and will only hinder the least limber of potential passengers. All but the base 320i benefit from a CD player/radio system with six speakers. However, even the 320i costs a significant sum, so buyers may feel a little hard done by when they see it comes with a cassette player. A Logic7 system and loud speaker unit are available as options, but the standard system copes well. Only 330i models get metallic paint as standard, everywhere else in the range it is a not inexpensive option. 3 Series' traditionally look their best in dark silvers and blacks and the latest incarnation is no exception. A matt titanium trim is fitted as standard, although others are available. There is also a choice of leather. The light cream is perhaps too great a contrast with the predominantly dark dash and trim – darker shades look better. All but the base models benefit from Park Distance Control (PDC), which makes the job of reverse parking and distance judging far easier. However, the visibility from the driver's seat is good and shouldn't cause too many problems. Light steering is also a boon for those who do a lot of city driving. Run flat tyres with pressure sensors are fitted as standard. Four engine options – 2.0-litre (150bhp) petrol; 2.5-litre (218bhp) petrol; 3.0-litre (258bhp) petrol and 2.0-litre (163bhp) diesel. All models are fitted with a six-speed manual transmission as standard. A six-speed Steptronic automatic gearbox is available as an option. Trim designators are ES and SE.